Box Dimensions (LxWxH) 5.4 x 4.3 x 4.1"
30mm f/1.4 DC DN Contemporary Lens for Sony E is rated 4.8 out of 5 by 286. Rated 5 out of 5 by Nofi from Awesome Value! At less than half the price of the new Olympus 17mm Pro f/1.2 this lens is an excellent value. Though it is a bit slower (f/1.4) than its counterpart, the optical quality of this lens is second to none. I bought it for indoor photography under low light coupled to my Olympus OM-D EM-1 Mark II. While the lens looks very plain it has a nice solid quality about it. I have the Olympus 25 mm f/1.2 and was somewhat disappointed by the lack of sharpness. 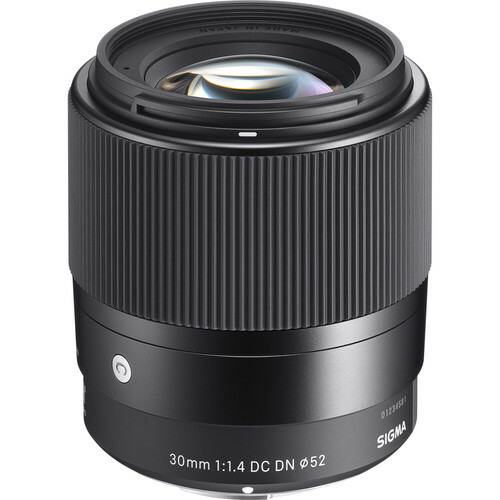 I hope someone compares this Sigma lens to the Olympus 17 mm Pro f/1.2. I would like to know how they stack up against each other. Hats off to Sigma for making a great lens! Rated 5 out of 5 by Donald from amazing I owned the Canon 85mm 1.2 and 50mm 1.2 lenses in the past and always missed the magical results they produced when I switched over to Sony E mount. But they had issues of accurate auto focusing and even when manually focused would only work for stationary subjects. Today the Sigma 56mm with the Sony 6500 has restored in part the magic of those legacy lenses for me. Small, lightweight and a perfect match for the Sony camera. But just as in the case with the FF 85mm lenses the depth of field is narrow when focusing close up so keep it on eye focusing to get the shot every time, see picture of our cat Mandy. The next lens I hope Sigma will release is a 70mm 1.4 lens. Rated 5 out of 5 by Bruce from Excellent addition to M43 I shoot about anything and a 30mm f1.4 is an everything lens, street scenes, street portraits, detail, night scenes, this is the diverse prime I must use. I've compared it to an Olympus 50mm f2 macro and this lens is in the same league but with all the newer focusing technology. Like the 50mm, this 30mm gets excellent quality wide open so lends to great isolation and soft bokeh. It was really worth taking time to read reviews on it but for the near $300 price tag, it didn't take long to realize this may be the best bargain in my M43 bag along with my Lumix 30mm macro for close ups. Guess I'd missed the Leica R 60mm Elmarit or Nikon micro too much until now. Rated 5 out of 5 by Cabs72 from Sigma does it again I want to start off by saying I was really happy about B&H notifying me when the lens was ready. It really is a great system and I had my lens the next day. I really can't say enough about this lens. It's light weight, fast and insanely sharp! It's a perfect fit for my a6000 and will likely live on my camera. Full autofocus capability (the 2.8 version only allowed for PDA in the center), eye autofocus works! My only complaint, and it's not much of a complaint really is that it does not come with the padded case that other sigma lenses do. No big deal really because I've yet to take it off of my camera. Hoping for sigma to make an 85mm version! Rated 5 out of 5 by David from One superb buy! I have wanted a lens in the 50-60mm f1/4 range for my OMD-1 for some time now, and was ready to purchase the new Oly 25mm f.1/4 PRO, except it wasn't in stock. I researched and decided to get this one because the reviews were generally positive and the price point was unbelievably cheap. Did I expect the same quality of product which I would get from the PRO lens? No, but the build quality is slightly better than what I expected and this lens exceeded my expectations in terms of sharpness and IQ to the point that I think I can wait a little longer before buying the Oly. This may be one of the few real optical bargains available that I am happy to recommend. Rated 5 out of 5 by PCC TEACH from A nice find I was ready to buy the new 25mm f.1/2 pro, and was very disappointed when it wasn't in stock. I wanted something in the 25-30mm range that I could use for portraits and work in low light when I discovered this gem. I did the research, read the reviews, and bought this to use for a project I am doing over the holidays. For the money, I wasn't expecting much in terms of build quality and was pleased that it was better than anticipated. I did, however, expect it to be sharp and have decent IQ, which it does. This may be one of those rare finds of quality optics at an amazingly low price, that should work fine for my needs. It is a nice product that surpasses the expectations of the price. Rated 5 out of 5 by Henry from excellent lens Although it is a little large for a format called micro-4/3, it seems these larger size lenses are a result of advanced designs which allow for more light intake and less overall issues between the lens and sensor. But the slightly larger size is a mild trade-off for the quality. And, its really not a heavy lens, and balances well on my olympus Pen-F. Image quality is superb. Very natural feeling to the photos, without any brittleness that I sometimes see with M4/3. The autofocus is fast and accurate. the color rendition reminds me of the Panaleica lenses. Overall a good purchase - and the price is a big plus! It's been glued to my Pen-F since I got it. Rated 5 out of 5 by DUSTIN from Very sharp and promising for stills and video. I’ve use nearly every lens available for Sony‘s APS-C mount. This is among the sharpest of all of them. It reminds me of their 30 mm f/1.4 which is also well known for its sharpness. Chromatic aberration seems very well managed. The bokeh is very nice and round at 1.4 which is a really great thing to see on such a wide lens. FOR VIDEO some people have had concerns about it making noise. I'm not sure about internal mic because I never use that, but with a Rode VideoMicro attached autofocus motor noise is almost zero when I turn my computer volume up full blast when playing back a clip recorded in a quiet room.